Improving Stroke Timing | Mediterra - Swim & Run Better Than Ever! I’ve been experimenting with a new way to use the Tempo Trainer in adjusting the stroke timing, in order to preserve a long stroke at faster tempos. In TI we use a Focal Point called the Patient Front Arm to help train this skill. This long stroke skill is recognized also by the terms Stroke Overlap, and Front Quandrant Swimming. I’ve made a crude little diagram here to try to graphically represent what I’ve been examining in my mind while swimming lately. The red oval represents the pathway the hand travels during the stroke cycle, centered roughly where the shoulder pivots. The yellow vertical line represents the shoulder joint which divides Front section and Rear section of the stroke cycle. You can also see that the Recovery Arm is half-way overlapping the Catch Arm (the Recovery Hand is at the point of the elbow on the opposite arm). This is what is known as Stroke Overlap. When using a Tempo Trainer, you can take a measurement of your own stroke overlap by setting your Entry (just in front of the head) to the First Beep then paying attention to that same hand, see where it is positioned at the very next Beep. If you have decent overlap that catch hand will be at your goggles or still in front of your head when the second beep hits. 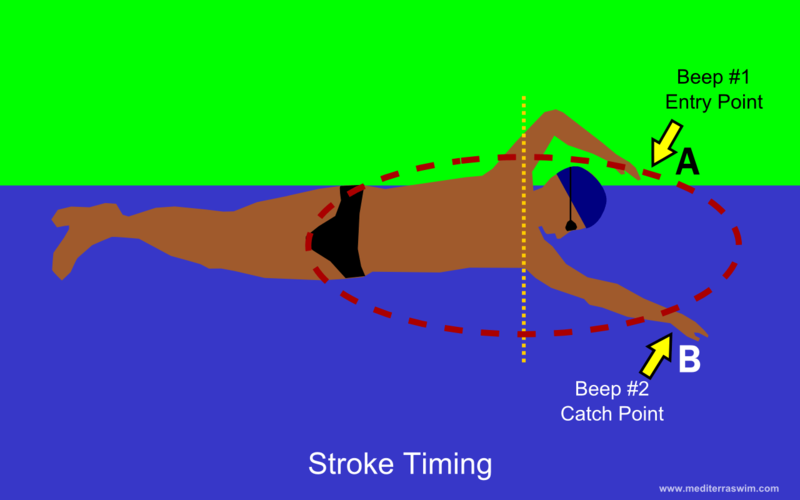 Achieving this overlap in your normal stroke is one of the hallmarks of well-developed freestyle technique. And the faster you attempt to swim the more critical this overlap will be in reducing the water resistance working against you. What TI adds to this is focusing on extending the Catch Arm and body line straight ahead, projecting forward the force flowing through the body (not hanging there purposeless creating dead space in the stroke as some critics mistakenly assume) as the Recovery Arm completes its return to the front of the body. You’ll notice micro-seconds of additional extension happening, from finger tips to axilla to hips to toes, when you examine videos of Phelps in the 200m and Sun Yang in the 1500m. There’s no dead space – there is perfectly timed projection of force forward utilizing the available thrust while the Recovery arm gets back into position for another stroke. One of the keys to achieving this is constructing the stroke so that each arm learns to move through its stroke cycle independent of the other arm. I call this ‘disconnecting’ the arms from each other. In contrast, under-developed swimmers (even ones who consider themselves accomplished) cannot move one arm without moving the other- we might call this the Windmill Effect- the Catch Arm must pull back while the Recovery Arm swings forward. This is typical of swimmers who do not have balance under control. The Windmill destroys Stroke Overlap. The faster the tempo the greater the loss in overlap. The worst state to be in is to have one arm in the back quadrant while one arm is in the front- completely opposite of each other. The drag created by this poor timing is devastating. Having the two arms able to move through the stroke cycle independent of each other is a critical skill for open-water swimmers. For instance, variable stroke timing enables us to adapt each stroke (and even shift the pace of the catch and the recovery phase) to the pattern (or chaos) of the waves in whatever direction they might come at us. By this we can conserve energy while holding pace in a variety of conditions. Think of it as shifting gears on a bike – it would be quite tough to race on rough terrain on a fixed gear bike! Yet it’s tragic that so many people do this while swimming. It is also critical for sprinters who understand the importance of preserving a long stroke length as they train to stroke at extremely fast tempos. The only way to get that long stroke is to train for it and protect it as tempo increases – as tempo goes up the stroke will only shorten because of the increasing forces working against it. The key then is to first get the long stroke and then protect it, training in such a way to know how to make only the most calculated trade-offs between length and tempo. And in order to protect it a swimmer has to learn to vary the speed at different parts of the stroke cycle – for this a Tempo Trainer is invaluable. If there is no balance, and the two arms cannot move independently of each other – there is no chance. Done right, it allows the best swimmers to preserve that overlap and gain more ground for less effort than their competition. Of course, you want to know how to train those arms to stroke independently of each other, don’t you! I’ll work on the next post to share how we can use the Tempo Trainer to measure and adjust this stroke timing. This post made me think of 2 questions. The first is on catch timing. If both hands are in the front quadrant on each stroke does that mean that the recovery is at a faster pace than the catch. It is only way I can think to have both hands in the front quadrant on every stroke. It the purpose of this to have continuous propulsion? When I swim my arms are opposite all of the time. Since the catch is only 110 degrees of the cirlcel my arms go in I have propulsion for 220 degrees of the 360 degree circle, and am coasting roughly 1/3 of the time. My stroke feels like surges. Like rowing a boat. Stroke glide etc.only more often like the oars were 180 degrees apart. Secondly from your picasso like drawing, it made me wonder how deep my hands should go. i think back to the ti Idea that you swim you are creating friction that roughtly models a tennis can, and the goal of ti is to shrink the size of the tube without becoming so small that propulsion is lost. So… how deep do you dig on the catch? I know you have suggested kicking in short efficient strokes rather than big strong kicks. How does this relate to your arms. Ah, yes. You are anticipating my next intended blog post (or continued series) on the topic of catch timing. I’ve been working on a way to graphically show what is happening in the segments of the stroke cycle, in terms of seconds and overlap between the two arms. I suspect this is where many coaches are on the right track knowing that we need to get higher tempo, but missing a hard to notice detail: the stroke can have variable rates at different parts of that stroke cycle and this can only be taken advantage of if the arms are trained to move independent of each other. I believe this understanding is the KEY to developing a long stroke with a high tempo – the equation for speed – the goal of any champion swimmer, whether they realize this is what makes it or not. Some do it so naturally, but don’t realize how they do it. And depth of the catch is dependent on the shape of the catch (including degree of bend in the elbow)and getting the maximum leverage for the least effort. It makes sense if we were using a crowbar or seesaw to pry or lift something, but something we don’t connect to the catch so easily. Imagine this: get a friend and sit down at a table to prepare to have an arm wrestling match. Clasp hands and scoot back from each other so that your arms are nearly straight. Now wrestle! Immediately, your brain understands this is a totally inferior leverage position to overpower your opponent. So why then do we try to take a stroke with a nearly straight arm? My point may be easily understood now, but the formation of that kind of catch in the water is a dynamic 3D puzzle, with precise positioning of shoulder stabilizers, elbow stabilizers, and timing a corkscrew like motion with all this parts rotating around each other. I’ll do my best to explain things with word in another post, but this level of stroke formation is where live coaching is profoundly more effective. I just had a workshop in Istanbul this weekend and yesterday’s session began with the kick and the catch and everyone was thrilled and totally absorbed in the exploration of these intricate skills. Please appreciate that these are truly fine, advanced skills – all yours for the learning – but they don’t come naturally to anyone, but a very gifted few. So relax and have fun learning them at your own pace. The good news: you WILL be able to learn them. But one quick tip on depth of the catch – imagine you will have to swim through a narrow tube, and you’ve got to keep that catch inside the tube walls. How small of a tube can you slide through while holding what feels like a strong catch? Experiment with bringing the catch hand closer to the body as it presses and the body slides past it. Ok so a follow up question: How about a suggested starting point for elbow bend? If we arm wrestle with completely bent arms it will be the most powerful move, but the stroke length will be so short as to be ineffective. In reading your last paragraph my guess is to start with a position that feels good and then try and make the tube smaller and see if the catch holds better. If not make the tube bigger until the power vs. friction of the bigger tube deteriorates the speed. Now we are reaching the limits of what I may be able to effectively describe with words! The spearing arm is extending forward. Done correctly the elbow has remained pointing out, directly to the side. If this is the case, at full extension point, let the pressure of water in front simply press the relaxed hand and forearm down to catch position, pivoting at the elbow. The elbow does not drop at this moment, instead it stays at the same depth and slides outward so that the hand can stay on the track in line with the shoulder. Or, in other words, the upper arm stays horizontal while the forearm drops into a steep angle, creating a ‘paddle’ surface with the hand and forearms as one straight firm unit. I hope this can be visualized by a mere description with words. If you did this with both arms at the same time you might look like you were hugging a large pilates ball, with arms draped over the upper half, curving down. The goal is to begin the catch the water as far in front of the body as comfortably possible. EVF is Extreme Vertical Forearm. It is a catch style easily recognized in elites. I would not recommend this for common swimmers because of the risk to the shoulder and the extreme professional care that should guide the formation of this technique. It gets more grab but it is an example of pursuing ultimate speed via a technique that presents much greater risk to the joint. I don’t believe it can be wisely sustained for long distance or is practical for a lifestyle of swimming. Instead we may more safely aim for a moderately steep angle vertical forearm.